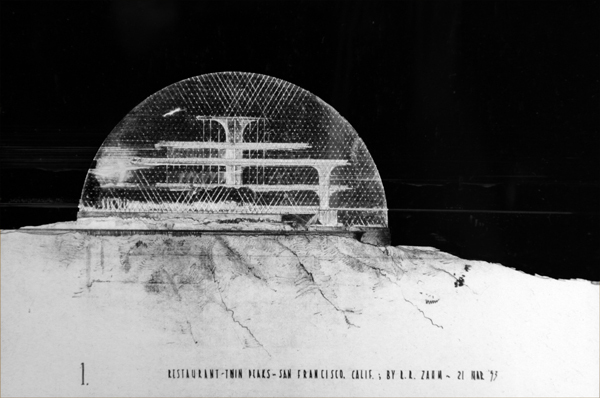 I’m in San Francisco for a couple of weeks putting together the Buckminster Fuller installation for the SFMOMA show I mentioned in my last post. It’s exciting to see the project begin to come together, but also daunting! I’m collaborating with Obscura Digital on the installation, so the other day I visited them and checked out a wooden prototype of the piece they’re making. It’s a sculpture inspired by Fuller’s great Dymaxion map, pictured below. There will be four projectors behind the sculpture, projecting my video onto all of its surfaces. The video I’m putting together is called “Buckminster Fuller and the Bay Area: A Relationship in 12 Fragments (inspired by the Dymaxion Chronofile).” It’ll be about 30 minutes long and will screen as a loop. 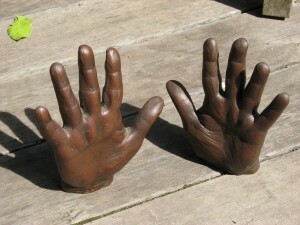 Like the title implies, it will look at Fuller and his relationship with SF through a series of vignettes, ranging from his proposal to build a domed restaurant at the top of Twin Peaks in the early 1950s to a weirdly lifelike bronze cast of Fuller’s hands that the sculptor Ruth Asawa made in the 1970s. “The Dymaxion Chronofile,” by the way, is what Fuller called his enormous archive of papers, now located at Stanford, where I’ve done a lot of research for this project. The big challenge with this piece is figuring out how to use all the screens––to make something that’s truly multi-channel and collage-like, but also maintains some narrative and clarity. It’s a great problem, but also fun, and definitely new ground for me. I am working some hella-long hours! Back to Obscura Digital––remember that huge, world’s-largest rubber band ball, which used to be in the corner store on Dolores by the Lone Palm? 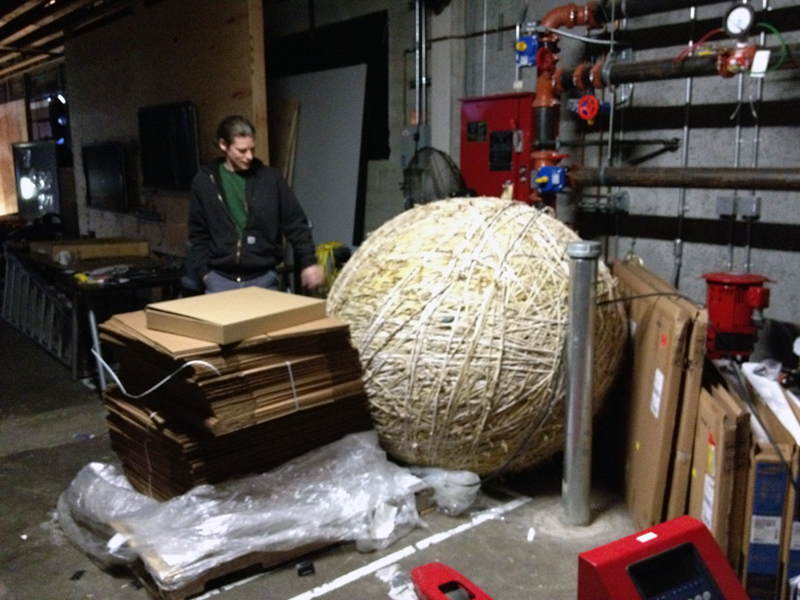 The family that owned the place was building the rubber band ball for years, hoping to get a Guinness World Record. I’d wondered what had happened to it, since it’s not in that store any more. Turns out it’s actually in the basement of Obscura Digital now!